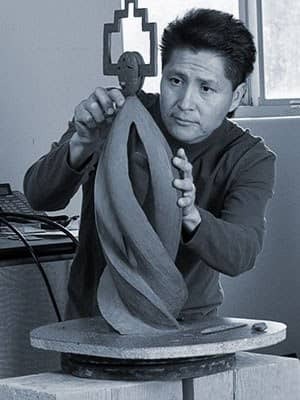 Joe Cajero was born in 1970 in Santa Fe, New Mexico, and raised in Jemez Pueblo. He is a descendant of a long line of Pueblo artists, including his father, a painter, and his mother, a potter. Cajero often accompanied his mother to Indian art shows throughout the Southwest. He also spent many hours with his maternal great-grandmother, Petra Romero, listening to the wonderful stories she told of times gone by. These stories provided him with a solid foundation in his traditional culture, which continues to inform the work he does today. When he was fifteen, his mother convinced him to try clay; his first figure was a bear, and it sold before it had dried. With his mother's encouragement, he continued making figures, and eventually attended the Institute of American Indian Arts in Santa Fe. His mentor and cousin, Felix Vigil, taught him to look inside himself for inspiration. Although Cajero continues to make the smiling koshari figures he is internationally known for, he constantly strives to challenge himself with fresh ideas, new techniques and imagery. His recent bronze figure work has led to the opening of new creative doors for the artist. "It seems I've been developing my skills . . . to lead me to work in bronze, and working with bronze has enhanced my skills with natural clay." Cajero resides in the small community of Placitas, New Mexico. He enjoys golfing, fishing, bow hunting, camping and a daily workout.